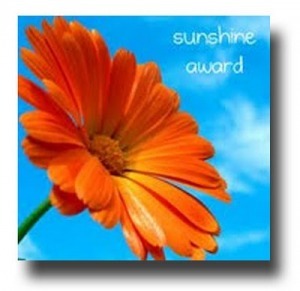 I’ve been nominated for the Sunshine Award, and in true blogger fashion, I thank Robert O’Rayne for the nomination. To accept this award I will answer 10 questions, and nominate 10 bloggers deserving of such an award. Favorite color: Purple. A rich purple. Favorite animal: Dogs, and lion cubs. Favorite non-alcoholic drink: Water, with a lemon please. Prefer Facebook or Twitter? Facebook. I still don’t understand Twitter, and Facebook is starting to get on my nerves. My passion: Designing clothes. Nothing is more soothing than the frustration of creating clothes. Prefer getting or giving presents: Giving. I can never think of what it is I want. Favorite pattern: Paisley. I know, cliche, but I love it! Favorite day of the week: That’s easy, Friday. I will notify the nominees by commenting on their blogs 🙂 .